A public park in west central Dundee comprising a wooded hill on top of which stands an astronomical observatory which is the only public observatory in Britain. Once part of the Balgay Estate of Sir William Scott, the land was bought by the city fathers and Balgay Park was opened in 1871 by the Earl of Dalhousie. It was intended to improve the health of mill workers who lived and worked in poor conditions. 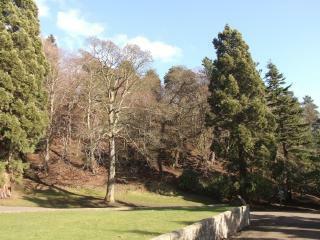 The park offers pleasant walks along a network of footpaths, together with fine views across the Firth of Tay. The woodland includes mature deciduous and coniferous trees. Opened in 1935, the observatory was endowed with money bequeathed by John Mills (1809-89), a local manufacturer. Balgay Park forms the centre of an extensive green space, with Lochee Park located to the north, Victoria Park to the south and Balgay Cemetery to the west, also on Balgay Hill.